From Manhattan Beach to Mid-City, Cox has helped develop some of the city’s best bars. If you have a favorite cocktail program in L.A. chances are that award-winning mixmaster Julian Cox had a hand in it. Seriously, that guy seems to be everywhere. He got his start working under renowned bartender Sam Ross at Comme Ca, where he honed his skills on creating variations of classic cocktails. 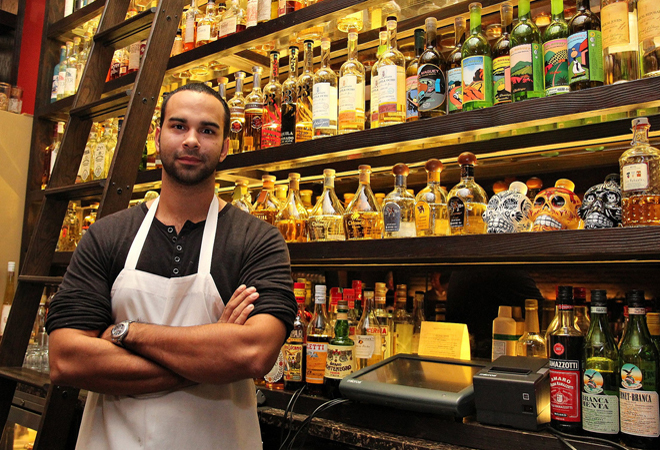 He then went on to build a bar program for Chef John Rivera Sedlar’s much lauded downtown restaurant Rivera in 2009, where his unique and fresh cocktails won him recognition and praise, like the 2010 Rising Star award and a nomination for 2012 Tales of the Cocktail Best Restaurant Bar. And things snowballed from there with Julian creating the bar programs for foodie favorite restaurants like Sotto, Picca, Playa, Short Order and now the much-buzzed-about Bestia and Petty Cash. On June 29 he’ll be popping up at the 4th Annual L.A. Street Food Fest at the Pasadena Rose Bowl where he, along with Josh Goldman, will be serving up boozy nitro Otter Pops. But I was able to catch up with him for my recurring Q&A with L.A. bartenders. Here are his quick answers about his, yes, other new bar program at Circa in Manhattan Beach which features several cocktails on tap as well as bottled cocktails. The Phil Collins [draft cocktail with vodka or gin, grapefruit, lemon and seltzer] or Jane’s Addiction [vodka, lemon, _no sherry, seltzer]. Any night at the beach when you are looking for a great spirit to sip on and some killer food. Actually participating in service and hospitality. The people that work for us. Where do you like to drink in L.A?